Back in 1972, German political sociologist Claus Offe published a book on the Structural Problems of Late Capitalism which, for almost two decades, inspired and stimulated an international and transdisciplinary debate on the role of the state in contemporary capitalism. An academic debate which, paradoxically, began to wane as the issues about which Offe had been writing became even more prominent: the "Contradictions of the Welfare State" (the title of a collection of Offe’s main contributions to the debate published in English in 1984) and democratic capitalism’s reality of the permanent "crises of crisis management". Since 2008, it has again become a widely shared diagnosis that advanced capitalism is in crisis. However, there is either scholarly disagreement or (more often so) mere perplexity when it comes to understanding this crisis and to explaining the prevalent patterns in dealing with it. 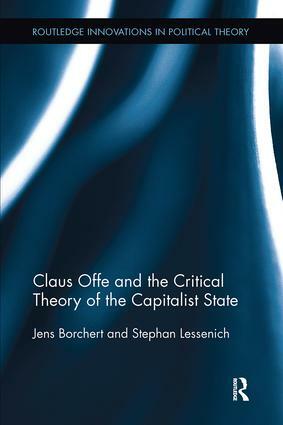 In this volume, Jens Borchert and Stephan Lessenichcritically combine a reconstruction Claus Offe’s approach to state theory with an analysis of the current constellation of democratic capitalism based on that same theory. In doing so, they expertly argue that his relational approach to state theory is much better equipped analytically to grasp the contradictory dynamics of the financial crisis and its political regulation than competing contributions. This is why systematically revisiting the theory of "late capitalism" is not only of a historical concern, but constitutes an essential contribution to a political sociology of our time.